Obituary – Grim, Karen Joyce (Elliott) « Perry High School Alumni Association, Inc.
﻿Band ’58-’63, F.T.A. ’60-’63, Teen Town Council ’60-’61, Student Council ’60-’61, Junior Play ’61-’62, Christmas Vespers ’60-’62, Glee Club ’60-’62, Spanish Assembly ’59-’61, All School Revue ’60’62, English Assembly ’60’61, Perryscope Staff ’61-’62, Band Ensembles ’60-’62. 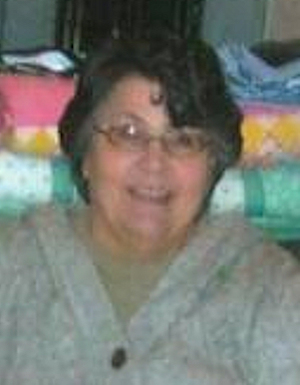 Karen Joyce (Elliott) Grim, 63, of Perry, OK, was the daughter of Forrest and Georgianna (Blake) Elliott. She was born on February 19, 1945 in Oklahoma City, Oklahoma and died Monday, January 19, 2009 at Perry Memorial Hospital. 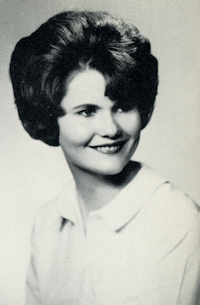 Karen was a graduate of Perry High School and attended classes at Northern Oklahoma College in Tonkawa, OK.
On November 9, 1963 she married Bud Grim at the First Presbyterian Church, Perry, OK. Karen began her career at Permanent Cookware in Perry, OK and with Bud, later co-owned several Ditch Witch Dealerships, but her primary focus and proudest accomplishment was to just be mom. Bud and Karen divorced in 1989. Karen later worked for approximately 10 years at the Perry Memorial Hospital as a dietary aide until 2008. Karen was a lifelong member and Deacon of the Perry First Presbyterian Church where she enjoyed singing in the choir. She was a member of PEO, Chapter BH, of Perry, OK. She was a member of the Stagecoach Community Theatre where she enjoyed performing, directing and being a part of many plays. She also enjoyed spending time with her family and her pets. Karen is survived by a son Brian Grim and his wife Karee of Perry, OK and a daughter Tami Redus and her husband Kenny also of Perry; four grandchildren Emily and Jake Grim and Makenzi and Hadyn Redus; two brothers Glen Elliott and wife Shirley of Perry and Gene Elliott of Perry; one sister, Roberta McCulloch and husband Ken of Wickenburg, AZ; and numerous nieces and nephews. Memorial services for Karen Joyce Grim are scheduled for 2:00 p.m. Friday, January 23, 2009 at the First Presbyterian Church with Rick Rhodes officiating. Memorial contributions may be sent to the PEO Cottey College Fund c/o Perry Funeral Home, 203 E. Fir Ave, Perry, OK 73077.